When I say Zarex, do you think ancient Greek mythological hero or zebra? For those of you staring blankly, it is sweet fruit syrup that can be mixed with water, poured over shaved ice, tossed into cupcakes or used in alcoholic drinks. It was once a favorite treat in the Northeast, but its popularity dwindled and it faded to the back shelves, eventually disappearing entirely. 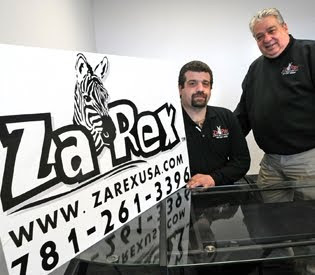 Two South Shore entrepreneurs are reviving Zarex, along with its black-and-white-striped mascot. Arthur Dove and Joseph Croce are counting on a wave of nostalgia combined with the modern day power of the Internet to fuel sales. They’re hoping that by now at least a few of you are humming the Zarex jingle. It all started with a trip to the grocery store. Dove discovered the product was no longer available. He was dismayed. He’d been brought up on the drink mix. He gave it to his children and then to his grandchildren. Dove called the manufacturer, One Pie, and learned from the chief that the company had shed the product not because of declining sales but rather a desire to concentrate on its canning business. “Then out of the blue, I asked if he’d be willing to sell it,” Dove said. The answer was “yes” and the negotiations began. Dove joined forces with Croce, who was interested in starting a business, to distribute the drink. The two are colleagues the ambulance sales and maintenance business; Croce is a general manager and Dove is in sales. Dove figures selling is selling, whether it is emergency vehicles or sweet syrup in 16-ounce bottles. “My belief is that if you have a good product, people will buy it,” he said. They are working with a manufacturer now and plan to be quenching thirsts before summer starts. They plan to go on tour distributing samples to remind people about the drink and win some new devotees. The toughest part so far was the negotiations, Dove said. One Pie executives were helpful, but it was still a delicate process. Setting up production was simpler. They went with the company that had been making the syrup until recently. The product certainly faces stiff competition with an abundance of already-mixed drinks on the shelf along with a number of popular packaged mixes. Dove said he believes Zarex is smoother and sweeter than what’s available and it comes with wonderful memories. The previous Zarex owner didn’t put a lot of effort into marketing the product. Dove and Croce will rely more heavily on the Internet to reach former New Englanders who are now spread across the globe. “Once you see the name, especially in New England, people know what it is. It takes you back to your childhood,” Dove said. The plan is to start with the traditional bottles and later add smaller, more portable packets. Eventually, they’d like to add a sugar-free version to expand the appeal. For now, Croce and Dove are cautious. They’ll keep their day jobs while they try to expand the business. You can all now breath a sigh of relief to know Zarex is BACK!!!! Bring it on!!! I for one am another fanatic when it comes to comfort foods/drinks and Zarex is one. Im from Cambridge, Mass and now live in Central Florida. I hope that there is a good marketing strategy so that when it does come to the stores I will be able to purchase it> Good Luck Guys!!! big fan here also. Seems to be slow getting back on the shelves. I have sound something SIMILIAR but not nearly as good - a fruit punch mix from Schwann's delivery. It's blue raspberry and tastes like the red raspberry Zarex. Yay! I was psyched to see Zarex back on the shelves at the Johnnie's in Arlington. My dad loves it, so I'm delighted that it is available once again. Thank you for keeping this New England tradition going!